Melvin has had the privilege of speaking to over 3,000,000 youth through school assemblies, basketball clinics/camps and other events. In addition to speaking responsibilities, he is also frequently engaged in interviews and guest appearances in various forms of media. Melvin’s passion for reaching America’s youth has provided countless opportunities to speak, perform and share with groups. Melvin was born in 1971 and grew up in the ghetto of Houston, Texas. He was challenged early in life with extremely negative circumstances; however, he dreamed of playing professional basketball. At the age of 13, his father died. With the consistent pressure of financial burdens and surrounded by hopeless situations, Melvin turned to sports where hard work and endless practices kept him from trouble. During these years, he led the district in assists and steals, and averaged 16 points per game for the Eisenhower High School’s Eagles. 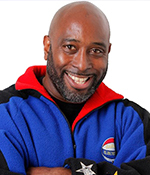 On March 17, 2000 Melvin Adams retired from the Harlem Globetrotters to fulfill a new dream – to challenge individuals to personal success through focus, work and determination. Today, he is privileged to speak before student and adult audiences sharing his personal story and inspiring others to fulfill their dreams.